Hi, I am interested in your 1934 Pontiac Other Pontiac Models (stock #4621-ATL) listed on Autotrader for $74,995. I'd like to get more information about this vehicle and confirm its availability. 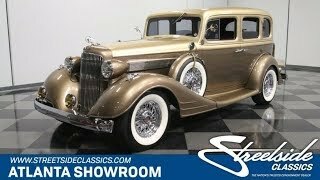 If youve been-there, done-that with Fords and Chevys, how about something a little bigger and bolder like this 1934 Pontiac sedan. Exceptionally well detailed, beautifully built, and featuring all the modern conveniences, it more than lives up to Pontiacs reputation for performance and style. The two-tone paint is subtle and elegant, and the overall look is simply gorgeous. The impossibly long hood on this Pontiac makes for dramatic proportions regardless of the color and thanks to exceptional build quality, it still makes a dramatic statement everywhere it goes. Its got almost no signs of use, and having won a wards at some of the biggest shows. The 1934 Pontiacs were also some of the most attractive cars on the road, with painted radiator shells and flowing fenders that seem to work especially well when the car is lowered and whitewall tires are stuffed underneath. It includes all the wonderful 30s details such as driving lights, large trumpet horns, fender lamps, and delicate little taillights on body-colored stalks. Dual sidemounts make this medium-priced Pontiac look and feel very upscale and it was carefully reassembled so everything fits pretty darned well. That beautiful trunk on the back was custom crafted just for this car and all the chrome was fully restored so it sparkles like jewelry. Notice the beautiful little speed streaks on the fenders, the rounded rear window, and the scroll-type door handles, all little details that make cars of the 30s so special. The red ultraleather interior is unexpected and unexpectedly beautiful against the soft paint job. The split bench is appropriate for a full-sized Pontiac like this and the back seat offers plenty of room for passengers. The nearly flat floor makes the interior feel especially roomy, making this a car you can drive long distances without feeling claustrophobic. Custom door panels were created to match the seats and the tan carpets are a wonderful contrast. A tilt column is fitted to the original dash, which is now full of artistic dials from Classic Instruments. A custom A/C system is installed under the dash with the controls neatly integrated into the center of the dash. It all shows virtually zero wear and the attention to detail throughout is extremely impressive. This Pontiac is a big car and to move this much sheetmetal, you need some juice. The original inline-6 was dumped, obviously, and it now gets motivation from a 350 cubic inch crate motor. moves the big sedan without ever seeming to work very hard and looks like it was born there. It was clearly detailed for show with a color-matched air cleaner from a 50s Buick, chrome valve covers, and a body-color firewall. A Holley 4-barrel carburetor and polished Edelbrock intake manifold help build power and are easy to tune, while custom headers deliver a mellow tone via a dual exhaust system. Its backed by a 700R4 4-speed automatic transmission and a Ford 8-inch rear end with 3.42 gears inside, so everything is easy to service and virtually bulletproof. The independent front suspension is a TCI Mustang II setup, so it offers disc brakes and power steering and the stance is exactly right. Old-school Tru-Spoke chrome wire wheels are fitted with beautiful 235/75/15 whitewall radials. This is a lot of car for a fraction of the build cost, and it runs and drives as great as it looks. Try something different and travel in first class with this lovely Pontiac. Call now!